Stock status is current as of 4/25/2019 10:12 AMET. Power up your devices with the Belkin Home Charger. The MIXIT Home Charger is a micro charger that comes in a unique, compact design. It works well with any AC outlet and charges your iPhone� or iPod� in an instant. This convenient charger even keeps other smartphones from Android and Blackberry� up and running whenever you need them. 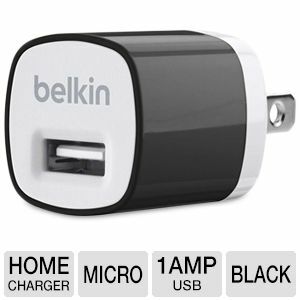 Grab the Belkin Home Charger right away!